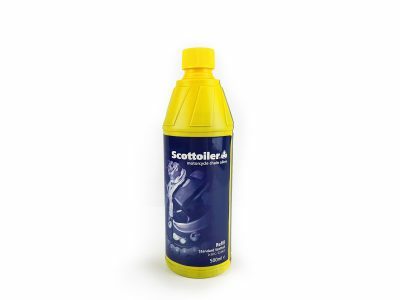 Scottoil Refill Lubricants comes in 2 different forms: Standard Blue Scottoil and High-Temperature Red Scottoil. Both oils have the same chemical makeup although the High-Temperature Scottoil is more viscous and therefore slightly thicker, meaning it will flow more slowly at higher temperatures than traditional blue Scottoil. Other than that, they’re the same and can even be mixed. So if you’re changing over from one oil to the other there’s no need to drain the system and start again, they’ll blend, saving you waste. Your choice of oils is dependent on the average riding temperatures you usually experience. Between average temperatures of 0-30°C (32°F-86°F), we recommend Standard Blue Scottoil. For higher average temperatures go for Red as it will be a more suitable lubricant on the chain and will also be easy to regulate through the vacuum operated systems. 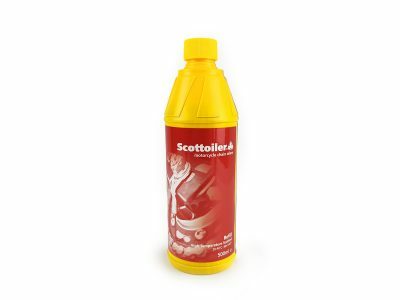 The Red High-Temperature Scottoil should be used in daily average temperatures of 20-40°C (68°F-104°F). In some cases, we would recommend you use Red High-Temperature Scottoil if your reservoir is located near a hot spot on the engine, as this will warm the oil in the reservoir to the operating range more suited to the red oil.